Blue whales are a member of the baleen family of whales, which holds the distinction for being the group encompassing the largest of the whale species. Of the whales in all the oceans, the Blue whale is the largest of all whales and most notably is the largest animal on earth today. This species of whales can grow to a length of 110 feet, slightly smaller in the north pacific at 75 to 80 feet, and can weigh in excess of 200 tons; that is heavier than the combined weight of 30 elephants. Even at birth, the blue whale is enormous, weighing as much as an adult hippopotamus. The baby blue whale drinks approximately 100 gallons of its mother’s fat rich milk every day for the first seven months of its life. Blue whales get their name from their dark-blue coloring. These whales migrate away from Alaska in the winter months to warmer waters off Baja California where they mate and give birth to their young. They are long lived, up to 90 years, with an average lifespan expectancy of 35-40 years. They tend to travel alone or in small pods of two or three. Fin whales, the second largest of the whale species, often travels with Blue whales. The Blue Whales are again returning to Alaska after being nearly hunted to extinction. Today, you may see the blue whales in the Bering Sea with larger concentrations around the Aleutian Islands. In July and August, they are again being reported in the eastern and northern Gulf of Alaska regions. Blue whales feed almost exclusively on tiny, shrimp-like crustaceans called krill, which it filters from the ocean with modified teeth called baleen. They can swallow one hundred pounds of krill in one gulp. They will eat four tons of food each day. They feed at depths of less than 325 feet where the light can penetrate which increases the production of krill. The average swimming speed is 13 miles per hour with top speeds of 30 miles per hour if frightened. They can dive at depths up to 1640 feet. That dive usually lasts for 10-20 minutes. They blow 8-10 times in between dives. The spout can reach nearly 30 feet in height. Interesting Facts about the Blue Whale. The blue whale is the loudest whale on the planet. Its sounds consist of trills, moans and pulses, which are short sounds that repeat at regular intervals. Its low-frequency whistles carry for hundreds of miles underwater and are often 40 to 50 decibels louder than a jumbo jet. Humans cannot hear these loud, low frequency sounds with out the aid of special equipment to raise the pitch to a level we can hear. The blue whale sounds can be detected over 700 miles, which means that they may well be a form of communication. The sounds may enable them to find food and a mate. Blue whales do not have any natural predators due to their large size. The calves can be vulnerable to attacks by killer whales. Blue whales had reached the point of extinction by the 1960’s due to whaling. Currently the International Whaling Commission and the U.S. ban the hunting of the blue whale. Humans can be a threat by modifying the whale’s habitat, vessel collisions and entanglement in fishing gear. Guidelines are available to whale watching boats so that whales remain unharmed and whale watchers enjoy the exciting opportunity to see these giant animals in their awe-inspiring environment. 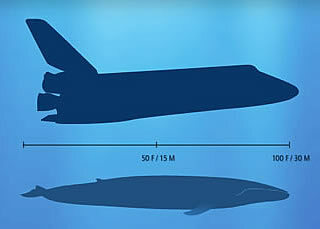 Length: Up To 110 Feet, Largest of all whale species. The females are larger than males, as with all baleen whales. Weight: Up to 200 tons. Average life expectancy: 35-40 years. Oldest being 90 years old. Travel speeds: up to 30 miles per hour with and average speed of 13 miles per hour. Typical submersion times: 3 or 4 minutes but can last up to 60 minutes, one hour. Habitat: From Baja California to the Bering Sea. Conservation Status: Blue Whales have been on the Protected Species List sense 1966. <strong><a href="http://www.whale-watching-alaska.com/whale/bluewhalesalaska.html">Alaska Blue Whales</a></strong>: Explore the watery world of the Blue Whales of Alaska! Information about the location, strength, and overall health of the species in Alaska. Numbers obtained from the Alaska Dept. of Fish and Game and NOAA.